Through the 1970's, working in some of Berkeley's most celebrated food shops and restaurants, including the Cheese Board, Chez Panisse and The Swallow cafe, John Harris also produced The Book of Garlic under his nom de l'ail, Lloyd J. Harris. A garlic activist, Harris founded the Lovers of the Stinking Rose garlic club whose "Garlic Times" newsletter inspired garlic festivals and theme restaurants from California to New York. In 1981, Harris founded Aris Books, a cookbook publisher, and in 1998 wrote and co-produced Divine Food: 100 Years in the Kosher Delicatessen Trade. In 2001, Harris wrote and co-directed the Emmy-nominated PBS special "Los Romeros: The Royal Family of the Guitar," and since 2004 has produced annual programs at the San Francisco Conservatory of Music featuring world-class guitarists playing vintage classical and flamenco guitars from his personal collection. The first battles of the American food revolution were fought in Berkeley, California in the 1970's by young food-loving aesthetes. These cooks, restaurateurs, food writers, and purveyors launched a movement known as California cuisine that would change the way Americans shop, cook and eat. Among their ranks was a young art student, L. John Harris, who also fought in the culinary trenches as store clerk, waiter, dishwasher, cook, food writer, garlic guru, cookbook publisher, and filmmaker. Now, in Foodoodles: From the Museum of Culinary History, with a satirical pen Harris celebrates (and skewers) the food revolution. Presenting his cartoons as exhibits in a virtual culinary arts museum, Harris puts on display over 90 off-the-wall and gastronomically incorrect images�twisted chefs, absurd kitchen gadgets, out of control vegetables, zombie food servers, trendy food fads, and "gastronimized" art historical icons. Accompanying the Foodoodles are the artist's curatorial commentaries including anecdotal footnotes, pet theories and peeves, sentimental homages, and thumbnail portraits of some of the heroes of the Revolution--Alfred Peet, Alice Waters, Julia Child, Jeremiah Tower, Bruce Aidells, Ruth Reichl, M.F.K. Fisher, and many others. I am still chuckling. L. John Harris pokes gentle fun at foodie cultists and the chef world, adding wit and levity to a field that has become increasingly self-important and trend-obsessed. A fun book! With masterful pranksmanship, Harris' cartoons totally tickled my funny bone. Dark, clever, Dada, absurd, the humor here is fun to chew on. 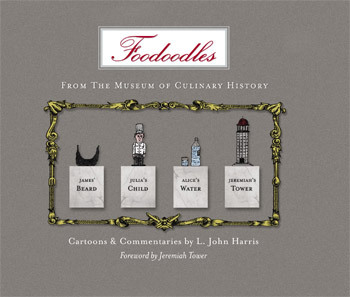 Whether the Foodoodles are poking fun at the high solemnity of the food movement or musing on sheer foodie silliness, Harris' food toons are a delight. Now about the Foodoodles: they are amusing, light, and yet they say much more than they seem to. At every image I laugh, or take initial umbrage, or think he has gone too far, or not far enough, but I always end up loving [the Foodoodles] because they have spontaneity, candor, and are always "true."